Turkish police use tear gas and water cannon to disperse protesters demonstrating against invasive Internet laws. Riots broke out in Istanbul's Taksim Square Saturday, prompting riot police to use tear gas and water cannon to secure the area. 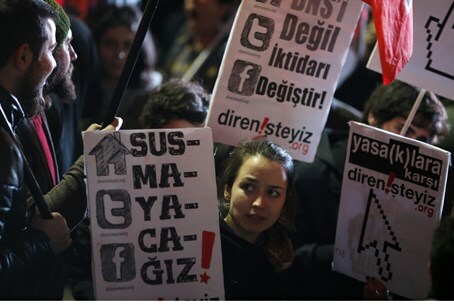 The reason: Turkey's new internet censorship laws, which allow the government to block websites for privacy violations without a court decision, and pressure internet providers to keep tabs on the populace's web history, according to BBC News. Over 2,000 protestors flooded into Taksim Square for the mass demonstration, the cumulative effect of ongoing frustration with the Islamist government, which is cracking down on dissidents after December's corruption scandal, according to Al-Jazeera. "Everywhere is bribery, everywhere is corruption," protestors chanted, in a translation provided by Reuters. Chaos ensued as riot police descended on the square, wearing full body armor and sporting water cannon, plastic bullets, and tear gas; demonstrators threw fireworks and stones at police forces and responded by vandalizing public buildings in the vicinity. The corruption scandal erupted on December 17 with the arrest of businessmen close to Prime Minister Tayyip Erdogan and three ministers' sons. In the wake of the scandal, Economy Minister Zafer Çağlayan, Interior Minister Muammer Güler and Environment and Urbanization Minister Erdoğan Bayraktar resigned; calls were made for Erdogan to step down after an 11-year rule; and Turkey has been thrown into a state of unrest. Erdogan's crackdown began almost immediately afterward. In under three months, Erdogan's government has replaced half its cabinet, purged hundreds of police, sought tighter control of the courts and fired executives from banks, communications networks and national television stations. BBC News notes that internet access is already restricted in Turkey, with thousands of websites blocked. Erdogan has publicly condemned social media, calling it "the worst menace to society" after Twitter and Facebook were used to organize anti-government protests last year. The new law passed Wednesday, and has already become wildly unpopular; there is intense pressure against President Abdullah Gul not to ratify the legislation, according to Al-Jazeera. Frustration intensified as the government acted quickly to flex its muscles with the new law, according to local news source Today's Zaman; Azerbaijani journalist Mahir Zenylov was booted from Turkey Friday, one month after the Prime Minister's office filed a complaint against him for posting anti-government statements on Twitter. Opposition leaders and human rights groups link the censorship laws with the scandal, and say that Prime Minister Recep Tayyip Erdogan has been enacting more and more measures to prevent the truth from reaching the eyes of the populace. "[A] defensive government is seeking to increase its power to silence critics and to arbitrarily limit politically damaging material online," a representative from Human Rights Watch stated Saturday. Martin Schulz, EU parliament chief, called the move "a step back in an already suffocating environment for media freedom." Erdogan defended the law Saturday, assuring a crowd of supporters in the capital city that censorship would deem the internet "more safe and free." "These regulations do not impose any censorship at all on the internet. On the contrary, they make it safer and freer," he declared. "It is out of the question that people's private data will be recorded."